A week ago I visited the current exhibition of manuscripts at Lille. It was mostly very unimpressive, with low-quality objects displayed in a bizarre setting. But it did have a few high-quality items, notably the two surviving full-page miniatures of the Liessies Gospels. 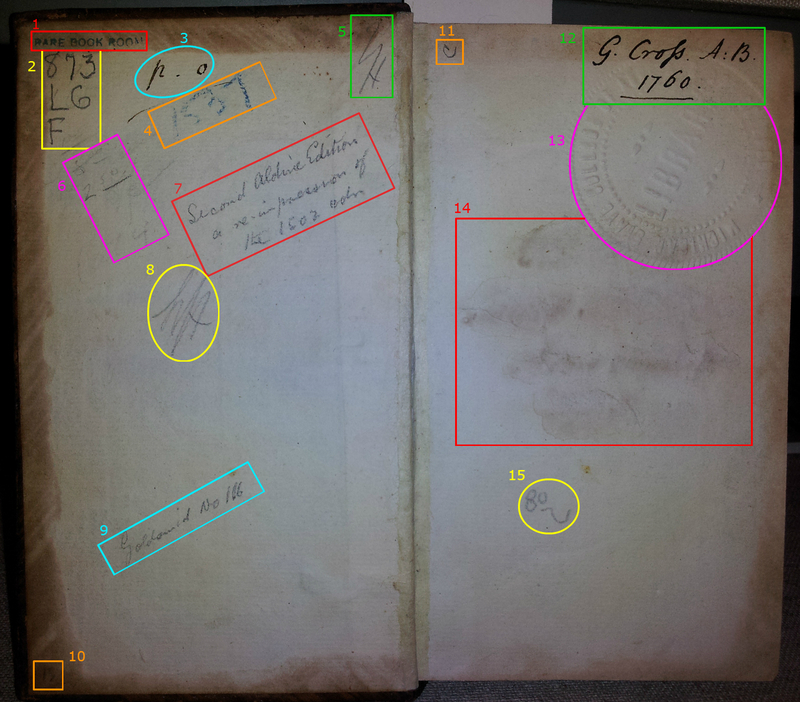 "What Counts as Provenance Evidence?" Charles Spencer, third Earl of Sunderland (1674-1722), his “books are easily recognizable by the bold shelf-marks written in ink on the verso of the upper cover in the upper left hand corner.” S. DeRicci, English Collectors of Books & Manuscripts (1530-1930) and Their Marks of Ownership (Cambridge, 1930), p. 39. An excerpt is below, but the full post is worth reading. As of last week, the MLGB3's online database included over 6,000 records for books and manuscripts owned by medieval libraries. In order to look at them in aggregate I used the ever-helpful wget utility to pull down each record in order. I was left with a gigantic mess of html with the useful data hidden within it. After extensive cleanup and parsing of the data I was able to throw the location names of the original medieval libraries as well as current owners against David Zwiefelhofer's geocoding service (which I believe uses the Yahoo API) to get longitudes and latitudes. This didn't go entirely smoothly as the names of ruined monasteries tend not to register very well in geo databases. Fortunately, there are a wealth of wikipedia entries providing detailed long./lat. information on a wide range of English historical sites and I was able to fill in the blanks. What most struck me from this preliminary view (I'll wait until the final MLGB3 release to make sure) is how much less movement there was than I expected. That is, if books owned by medieval libraries are any indication, the cultural patrimony of Great Britain has not moved far from its home. Over 93% (5900/6316) books from the MLGB3 data show up as being currently held in Great Britain leaving just 416 in other locations. This visualization of course elides the many movements of books between when they were cataloged or inventoried in the medieval period and when they reached their current place of residence. That being said, I wonder how a similar map of the dispersal of French or German monastic libraries would look? Are 93% still in their country of origin (loosely defined)? I doubt it. Exactly three years ago I wrote a blog post questioning the often-asserted link between Bodleian, MS. Auct. D. 4. 6 and Roger, abbot of Reading Abbey from 1156 to 1165. "The litany not only contradicts the destination claimed for the book, but also its date. ... In the litany ... there is an erasure of the fourth saint following the three English martyrs Alban, Oswald, and Edmund. There is little doubt that the erasure is of ... Thomas of Canterbury. The litany text ... must therefore be after 1173, and the connection of the book at the time of its making with Abbot Roger and Reading must inevitably be completely abandoned. ... neither Abbot Roger nor his institution was its original destinee"
Nigel J. Morgan, English Monastic Litanies of the Saints after 1000, II: Pontefract–York, Henry Bradshaw Society, 120 (London, 2013), p.33. The old image-link seems to be broken, but a large version of the image is available here.